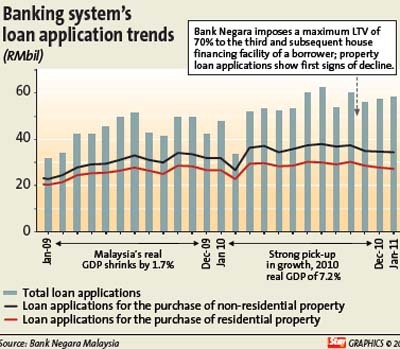 Bank Negara's move to require house buyers to pay a higher deposit seems to be weeding out speculation in the property market, some analysts said. Its monthly statistical bulletin last week showed that for fourth consecutive months since November, the number of loan applications to buy residential property has reduced. On Nov 2 last year, the central bank announced a 70% loan-to-value (LTV) cap on a borrower's third and subsequent house-financing facility, meaning that these buyers would have to fork out 30% of the purchase price. The move was prompted by fears of a retail credit bubble fuelling speculation on the prices of residential properties. Certain areas reported price spikes that are indicative of speculation and multiple-unit purchases by individuals. However, analysts cautioned that the data was not conclusive. Some analysts said the decline in the first couple of months might be seasonal and believed data from March would accurately show the effects of the LTV rule. RAM Rating Services Bhd's head of financial institutions ratings Promod Dass said: “Household financing facilities now account for approximately 55% (or RM489bil) of the local banking system's loans, with loans for the purchase of residential property comprising about half (RM238bil) of total household loans. “Although the full impact of this move has yet to filter through given the short time since its implementation, loan applications for residential property purchases have started slowing down in the last two months of 2010 and January. “The heftier down payment because of the more stringent 70% LTV cap is aimed at discouraging excessive over-leveraging in the property market. While the early signs are that this move has weeded out a degree of speculation in the residential property market, it will take at least six more months to gain a conclusive feel on whether such speculation has been curbed,” Promod said in an e-mail. Malaysian Rating Corp vice-president and head of financial institutions ratings Anandakumar Jegarasasingam said the LTV ruling was insufficient to control the level of household sector debt in the economy or an unhealthy property price appreciation. “Any individual who is purchasing a third residential property is either likely to be affluent or a reasonably savvy property speculator. If property speculation is to be curbed, the authorities should perhaps explore more direct measures involving taxes and prudential restrictions,” he said. Another issue was whether the current trend of lower applications for housing loans could eventually lead to a softening of the property market. Is it going to crash? The banks will very soon offer better homeloan rate to attract customers.